The terrace of Bonitas Winery is a wonderful place to stop and enjoy views over the vineyard and scenic Okanagan Lake in Summerland, BC, Canada. 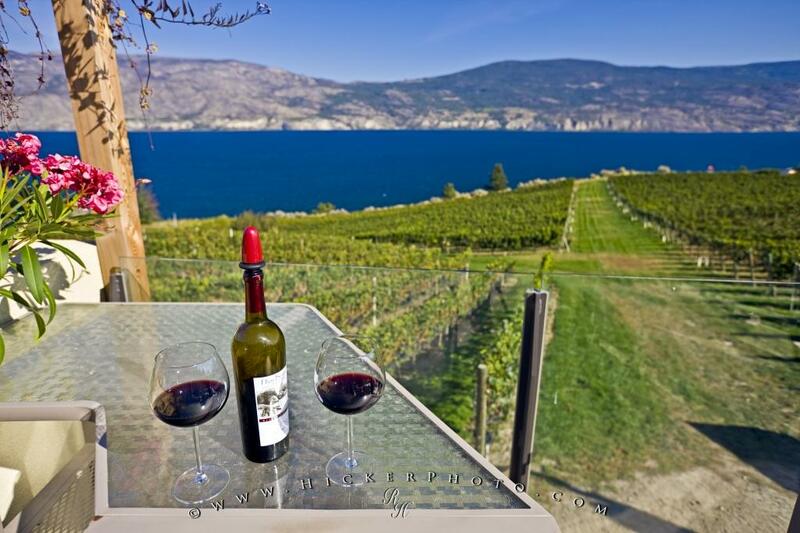 A totally relaxing experience: enjoying Bonitas Winery award winning wines on the terrace overlooking the vineyard and Okanagan Lake. The sunny, scenic Okanagan Valley in BC, is home to many vineyards and wineries including Bonitas Winery in Summerland. The terrace at Bomitas, is a great place to take in the views over Okanagan Lake and the vineyard, with rows of red and white grapes growing under the blazing sun. Bottle and two glasses of red wine served on the terrace overlooking Okanagan Lake and grapevines of Bonitas Winery, Summerland, Okanagan-Similkameen Region, Okanagan, British Columbia, Canada. Photo of the view of the scenic landscape surrounding Okanagan Lake from Bonitas Winery Vineyard.